The disillusionism-ridden post-Vietnam/Watergate era of the mid-1970s may not be fondly remembered by many people - oh, mainly recreational-drug connoisseurs and individuals who tell me that, yes, there actually were real job positions open in Cleveland back then (probably just smuggling and selling recreational drugs, though). Consider that MARJOE can be mentioned in the same breath as those others, and make it a priority to see the nonfiction feature (with co-director Sarah Kernochan in person, no less) at the Cleveland Cinematheque. Then you can always go see whatever shabby found-footage teen-horror picture is opening in wide release on Friday, to wash out the troubling memory of what you've just seen. 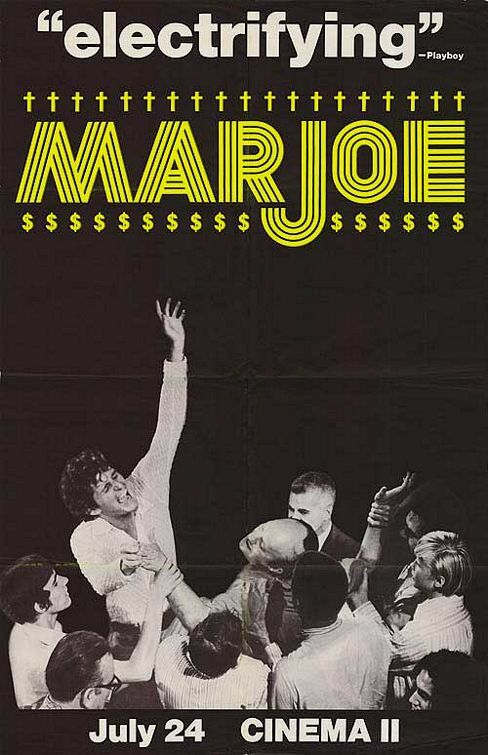 Subject of MARJOE is Marjoe Gortner, an alpha-likable enough guy, by appearances. The Long Beach, California-born Gortner was born into the family "business" of Pentecostal preaching, his unusual name in fact being a contraction for "Mary" and "Joseph." He was performing marriages at age four - a gig getting him listed in Ripley's Believe It Or Not. When the Gortner family's minister-father fled the scene, Marjoe became the household breadwinner on the traveling-evangelical circuit. As a teen, he says, Gortner grew disenchanted with the routine and quit evangelizing. But he resumed as an adult, strictly for the money, of course. Money which he collects by the fistful after a successful night of praising Jesus and saving souls. Here for the cinema-verite filmmakers Kernochan and Howard Smith, the charismatic Gortner exposes the tricks of his trade, religion degraded into a Nixonian business racket, all in praise of the almighty buck, of course. As we watch, Gortner can switch to tent-revival mode in an eye blink and speak in tongues. He does a "healing" on his dog, just for laughs and describes techniques for conflating phony miracles. He also debriefs the moviemakers on how to best conduct themselves around the pious Christians. In his more introspective moments Gortner wonders aloud if he's wicked for doing this schtick. Otherwise he only considers his church performances to have value as therapy, and he regrets having to use hellfire-and-brimstone stuff to ensure cash flow. He states that if he had to pick a religion ("thank God I don't have to"), the lucky faith would indeed be Pentecostalism - because the music is great, and he always wanted to be rock star. If Gortner had intended to burn bridges to his past, he certainly accomplished it. MARJOE gained a Best Documentary Feature Oscar, and Gortner had a short secular career as a Hollywood actor, often in bad-guy parts, like his role as an obsessed-psycho national guardsman in the disaster-movie landmark EARTHQUAKE. He even co-hosted the short-lived, proto-reality TV show Speak Up, America, in 1980 (for some bizarre, demonic reason, my memories of that thing are inexplicably vivid). Meanwhile, as we all know, evangelicals, Pentecostals, freaky end-timers, TV preachers and Christian fundamentalists of all sorts (except any who happened to be unfriendly to Big Business; read up on a Canadian Bible-believer named Weibo Ludwig and what befell him) got courted by the Reagan Republicans and have made a significant power bloc ever since. Though I must confess a soft spot for our own region's Rev. Ernest Angley, as I don't see him trying to mess around with the Constitution, peddling political endorsements or rewriting school textbooks, or am I just turning a willful blind eye? Marjoe Gortner seems to have withdrawn from the spotlight, which I personally find quite untypical for such a charisma-oozing schemer. And it is a little ominous to think about how a larger-than-life person who could so effectively hold people in the palm of his hand, get them to believe anything, no matter how outrageous, just walked away from it all.